Fighters loyal to the Islamic Courts Union load up on trucks to head to the front in December 2006. Said Ali, 21, is a volunteer fighter for the Shabab militia, the feared enforcers of the Islamic Courts Union. The U.S. brands the organization as an ally of al-Qaeda; in reality, it is also a nationalist anti-warlord movement that contains many Muslim moderates and has no international ambitions. He was 11 when he left his village in southern Somalia and traveled to Mogadishu to look for an education. But all public education had collapsed with the last functioning government in 1991, leaving private school the only option. And Said Ali, like most of his generation, was unable to afford the fees. Instead, he found a job as a porter, and then graduated to selling shirts and kikoi wraps by the side of the road. In time, he was given a job inside a clothes store in Bakara Market, where he earned about 10,000 Somali shillings (80 cents) a day. But often he would be forced to hand over his earnings to armed militias blocking the roads on his way home. He came out of hiding in central Mogadishu to meet TIME's Alex Perry. TIME: How did you join the Shabab? Ali: I was very angry with the militias. I decided to go to the training camps because I was tired of being robbed at roadblocks. At that time, before the Courts came to power, you could see someone kill a friend of yours, you could see a friend of yours robbed, the situation was as bad as that. The Shabab were good people. They trained you to defend your people ... . There were reserve troops and frontline troops. And after 2004, we fought against the warlords and thankfully we were successful. TIME: What sort of training did you get? Ali: How to handle a gun, how to defend, how to attack, how to drive a car, first aid, how to repair a weapon and endurance exercises. I would end my work then go for training from 4 o'clock until midnight. We were trained at a base in Mogadishu. TIME: Tell me about the war these past few weeks against Ethiopia. Ali: My position was at the front. Our plan was to sandwich the Transitional Federal Government [T.F.G.] at their base in Baidoa [in southwest Somalia]. But then the Ethiopians crossed the border behind us. We fought them, but there were bad people helping us, gangsters and thugs, there was misinformation, and this caused our defeat. TIME: Was it hard fighting? Ali: Many died from their injuries. It was hand-to-hand fighting. You have to kill people with your knife. One of my group climbed onto an Ethiopian tank and dropped a grenade inside the tank, but there was no blast and the tank just drove away. It was our duty to die at the front instead of being under occupation here in Mogadishu. Everyone prayed they would be killed at the front. TIME: Did you have any doubts about what you were doing? Ali: No, it was excellent. To defend your religion and your country  which is the same thing  was excellent. It wasn't our intention to fight Ethiopia; our purpose was to defend the people from the warlords. But it was excellent. TIME: How did you get away? Ali: We threw our guns down and took off our uniforms and set off on foot for the city. A friend sold his gun to some local people and paid for a bus ride for three of us back to Mogadishu. I went back to my workplace  now I work in a public telephone booth, connecting calls and selling pre-paid cards. TIME: What's the plan now? Ali: We want the Ethiopians out and we are preparing to fight them. We are ready, we are in Mogadishu. A few pockets of us are outside. We have a full connection with our leaders, and they are also inside Mogadishu. And when we start to fight, other people will come from Mogadishu to join us. We will come back more powerful than before, and we will clean those traitors among us away. TIME: Some people believe you have connections with al-Qaeda. Ali: The warlords used to send people out of the country, saying there were al-Qaeda. They took one of my neighbors to Addis Ababa and said he was an al-Qaeda terrorist. But the Ethiopians said he was not, and they did not want him. And the man came back to Mogadishu and told us what had happened to him. That's why we know that we have to defend our religion against Ethiopia. TIME: What do you make of [al-Qaeda leader] Ayman al-Zawahiri's call for Somalis to rise up against Ethiopia? Ali: We are not a special group. We are the Somali people. What we're doing is in the interests of all Somalis. People used to criticize the Courts when they were in power, saying they pressured people and did not allow this or that. But now people will see what happens without the Courts. If the Ethiopians go away, the Courts will come back and peace will come. I cannot speak English or Arabic  the warlords did that to me. I've never seen a government in my life, and the Ethiopians took away the only security I've ever experienced. People think our group is something else  al-Qaeda. We're not. We fight for the people. 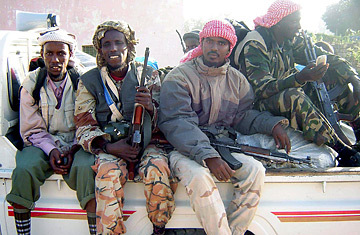 We fight for Somalia. If this government understands that its people need security, then that will be OK. But security has to come. And if al-Zawahiri says the people should do this or that, it could be right or wrong. He is not from here. Ali: I have been with Sheikh [Ahmed] Sharif and Sheikh [Hassan Dahir] Aweys and I also heard that al-Qaeda foreigners were fighting in Somalia. But I have not seen any. TIME: What do you make of the U.S. role in the region? Ali: It's Americans who are now attacking us. Americans are using Ethiopians to kill us. If America is an enemy of Islam, then I am an enemy of America  and America does many things against Islam. When the warlords were here, America wasn't around. So when we defeated the warlords, why did they come back? But the Ethiopians are not just coming to kill Muslims. They also want our long coast. This is the game. TIME: Isn't the need of the hour to unite and back a national government? Ali: I do not see any government here. I see only Ethiopians. I don't see a single Somali soldier. TIME: You're not going to give the new government a chance? Ali: Their chance is over. [Prime Minister Ali Mohammed] Gedi and [President Abduallah] Yusuf are nothing. They never get out of their pickups. What chance can they have after this? TIME: What the plan for starting the rebellion? Ali: The people and the Ethiopians will clash. [Hours after this interview, Somali demonstrators did fight Ethiopian troops at several points across the city.] And at that time, we will attack. We want the people to face the Ethiopians and when the people are ready, we will take action.